Transfer day from the Apuan Alps to the Karavanke/Karawanken Austrian/Slovenian cross-border UNESCO Global Geopark. The meeting will take place in the city of Bleuiburg/Pliberk in Carinthia (Austria). The historical Austrian/Slovenian name was strongly contested by the German-speaking Austrian nationalists in the years 2005-2007. The controversy ended after the statement of the Austrian High Court which established for this city the bilingual name Bleuiburg/Pliberk. 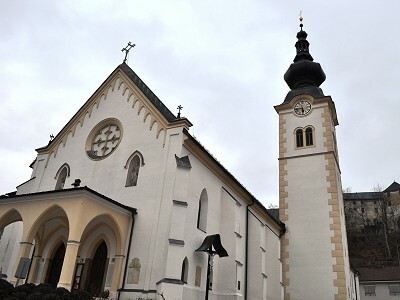 Currently around 30% of the 4000 inhabitants of the municipality are of Slovenian origin. Upon arrival, a quick visit to the small city center. The first stop is at the Kulturni Dom where the 41st Coordination Committee Meeting of the European Geoparks Network will take place. 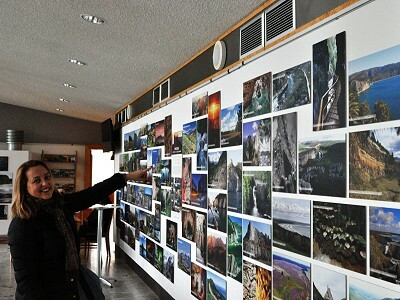 An exhibition with photos from all the European geoparks has been set up in the hall of the Kulturni Dom. The room is empty ... the work will start tomorrow with the Advisory Committee meeting. After a short search, our Alessia Amorfini identifies one of the images representing the Apuan Alps Geopark… she does not hold back a smile of satisfaction. Cold temperatures (around -2° C) allow only a short walk for an outdoor visit. View of the façade of the main church with the castle of Bleiburg/Pliberk in the background. 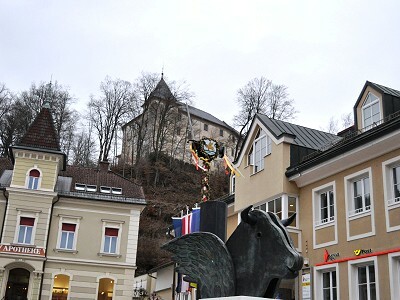 Bleuiburg means "castle of lead" testifying the link of this city with the mining activities related to the extraction of the lead from the nearby mountains. A statue along the main street of the village. Bleuiburg / Pliberk is very active from an artistic point of view, hosting several events and being home to the museum dedicated to the Austrian painter Werner Berg (1904-1981) who has dedicated his works to the landscape and the inhabitants of Carinthia. Today his work represents a unique documentation left as a legacy to this region on the Austrian-Slovenian border. The 41st Coordination Committee Meeting of the European Geoparks Network starts. 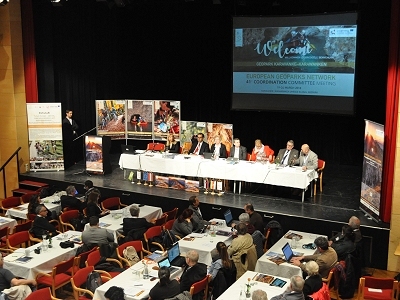 The Kulturni Dom main hall is crowded by the representatives of the 71 European UNESCO Global Geoparks coming from 23 countries. 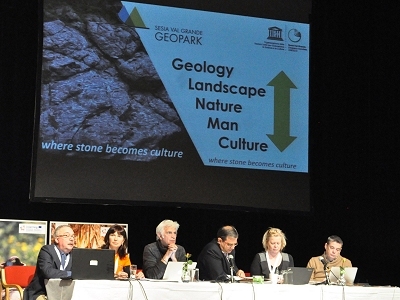 At the conference table (from right to left) the well-known Patrick McKeaver, Kristin Rangnes, Nickolas Zouros, Guy Martini and Suzana Fajmut-Štrucl, who welcomed the participants on behalf of the hosting geopark Karavanke/Karawanken UNESCO Global Geopark. 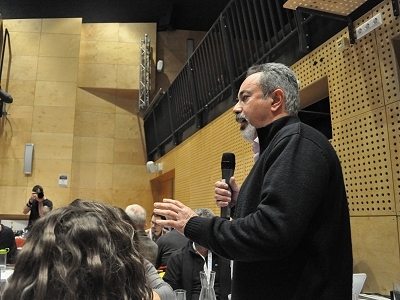 In the foreground table, part of the Italian delegation where you can recognize two with the double “A” initials: Alessia Amorfini (Apuan Alps) and Aniello Aloia (Cilento-Vallo di Diano) that, within the network, are elected member of the Advisory Committee and coordinator of the Italian Committee, respectively. 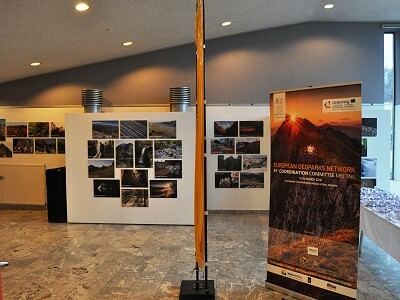 Among the morning communications, an important moment, particularly for Italy, is the one related to the next UNESCO Global Geoparks International Conference that will take place in Italy, hosted by the Adamello Brenta Geopark (Madonna di Campiglio, September 8 th -14 th, 2018) with the title "Geoparks and sustainable development". Violet Masè illustrates the organization of the scientific sessions and side events of the conference that will involve actively all the Italian geoparks. Next, still a proposal by an Italian geopark. 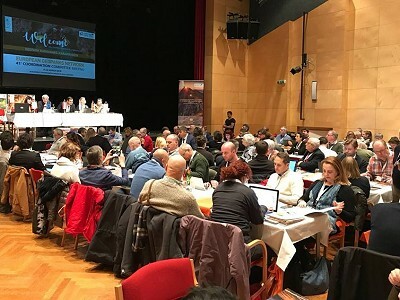 Tullio Bagnati submits the application of the Sesia-Val Grande Geopark to host the 43rd meeting of the European Geoparks Network in 2021. 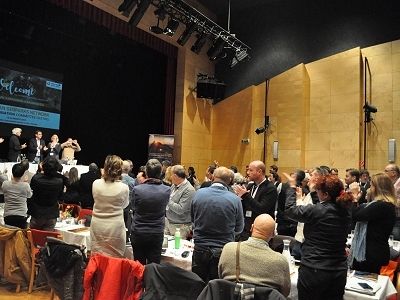 The meeting is going through a "historic" moment when the Committee tributes to Nickolas Zouros, at the end of his mandate, a "standing ovation" for the extraordinary work carried out for 18 years as coordinator of the European Geoparks Network. After the tribute to Nickolas Zouros, the procedure for the elections of the new coordinator and vice-coordinator begins. The first candidate is Kristin Ragnes from Gea Norvegica UNESCO Global Geopark, the currently expiring vice-coordinator. The second and final application as the new coordinator is that of Chris Woodley-Stewart from North Pennines UNESCO Global Geopark (England, UK) who would like a change of strategy more directed towards the management of the activities rather than the acquisition of new members of the European Geoparks Network. The only candidate as vice-coordinator is Babbis Fassoulas from the Psiloritis UNESCO Global Geopark (Crete, Greece). After a brief personal presentation, Babbis illustrates the activities of the Geohazard Working Group within the European Geoparks Network in which the Apuan Alps Geopark participates actively. The voting results were as follows: valid votes 104, Kristin Ragnes 61 votes, Chris Woodley-Stewart 43 votes. 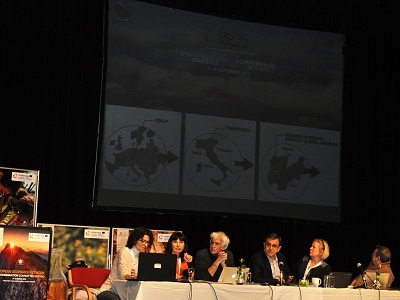 Kristin Ragnes is then elected as the new coordinator of the Coordination Committee of the European Geoparks Network. In the photo Kristin in her first speech after the proclamation. 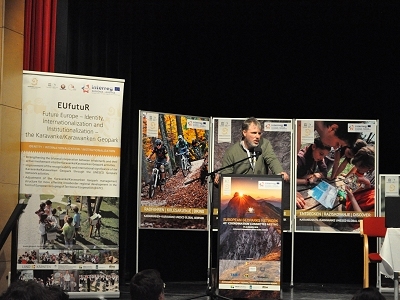 The second day of the 41st Coordination Committee Meeting of the European Geoparks Network is dedicated to the open session on "Sustainable tourism and regional identity in crossborder regions" which includes a pressconference and a Geofair set up in the gym of the Bleiburg/Pliberk Kulturni Dom. 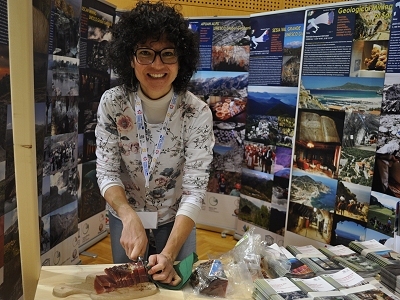 At the fair booth reserved for the Italian geoparks a smiling Violet Masè is preparing a delightful taste of speck from the Adamello Brenta Geopark. 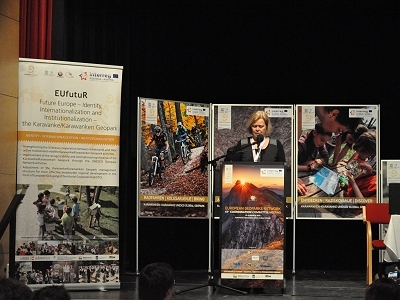 Behind her, the banners of the Italian geoparks have made the Italian booth, as a whole, one of the most attractive booths of the Bleiburg/Pliberk Geofair. 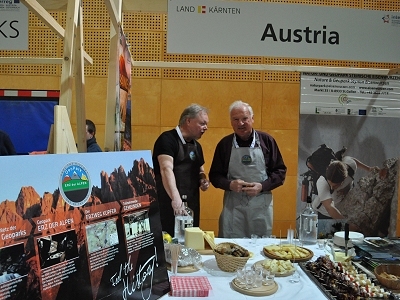 Helped by the proximity to Bleiburg/Pliberk, the Austrian geoparks have set up a rich food stand: cold meats, cheeses and schnapps! 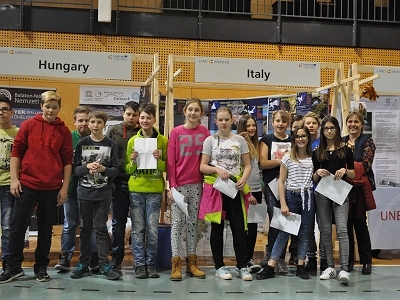 In front of the Italian booth for a souvenir photo the students awarded as winners of the competition held by the Karavanke/Karawanken UNESCO Global Geopark on the values of cultural identity in crossborder territories. Today is devoted to the visit of the Karavanke/Karawanken Geopark. 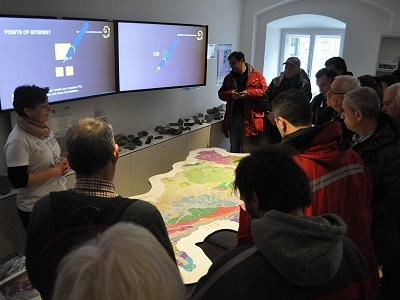 The first stop is at the geopark information center called "World of Geology" in the Austrian village of Bad Eisenkappel/Zelezca Kapla after a half-hour (about 25 km) transfer from Bleuiburg/Pliberk. 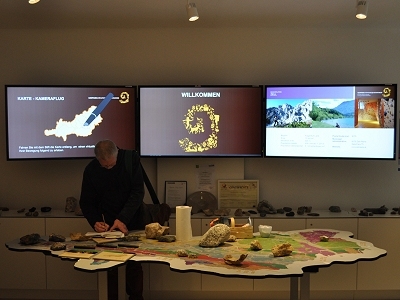 Antonia Weissenbacher illustrates the contents of the information center addressed to the geology and tourist offer of the geopark. 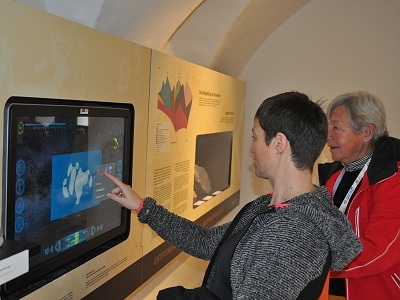 She starts with the flagship of the "World of Geology" center, the interactive Geopuls table that represents a geological map of the Karavanke/Karawanken geopark area on which by a pen camera it is possible to navigate through the characteristics of the region, from the geological to the cultural and gastronomic ones with different levels of in-depth analysis. Antonia shows some topics of the Geopuls table. In this case they are the archaeological ones concerning a symbolic place of the Karavanke/Karawanken Geopark, the mountain of Hemmaberg/St. Hema, an important Christian pilgrimage destination in Central Europe from 400 to 600 A.D. 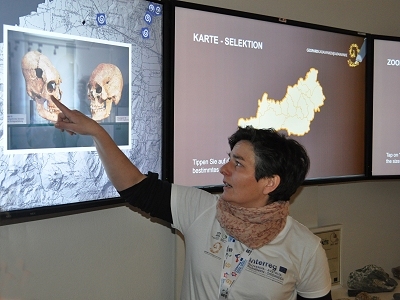 In another room of the information center "World of Geology", Sophie Justice from the Chablais Geopark "plays" with an interactive panel where it is possible to travel in the past (and in the future!) understanding the geological process of plate tectonics. The Geopuls table is truly a must! ... Even after the end of the visit, Manfred Kupetz, from the Muskauer Faltenbogen / Łuk Mużakowa Geopark, another crossborder geopark between Germany and Poland, continues to take notes on the operative principles of the interactive connections between geological map and information. The second stop of the excursion is at the Obir Dripstone Caves. 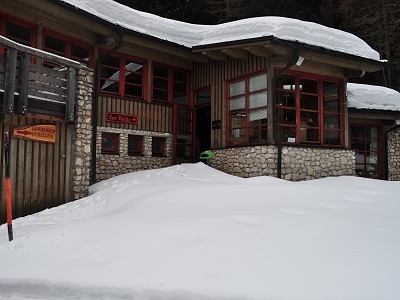 The tourist entrance, about 1000 m a.s.l., is buried under the snow! The Karavanke / Karawanken Geopark staff cleaned the 5 km of the access road to the cave/mine for this extraordinary opening during the excursion of the Coordination Committee Meeting of the European Geoparks Network. 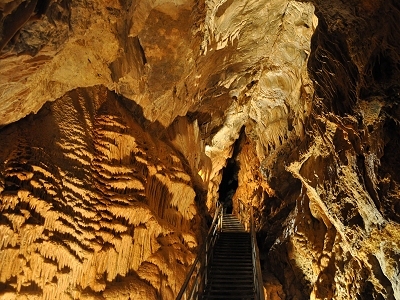 The Obir Caves were discovered in 1870 during the exploration of an active lead and zinc mine and were used for tourism since 1991 after the cessation of mining activity. 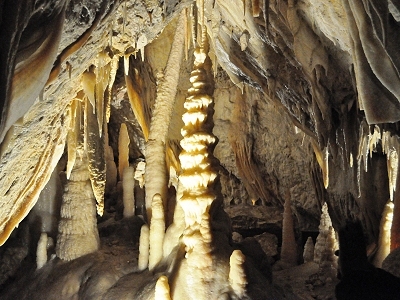 The caves were formed inside the dolomitic limestone of the Middle Triassic age. One of their characteristics is the very clear interaction between calcareous concretions and the geological structures, i.e. faults, along which the circulation of water is concentrated. In the photo, a fault is visible above the steel staircase. The Obir Caves are very rich in stalactites and stalagmites, often still living. In some parts, as in the photo, there is a real overcrowding of calcareous concretions! The exit of the caves is in the middle of a pine forest. The return to the road is along a path in the snow. 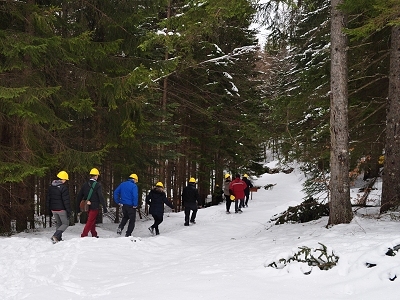 It has been an extraordinary and absolutely new experience for the Coordination Committee of the European Geoparks Network: it is the first time that the meeting excursion takes place in the snow...the Karavanke / Karawanken Geopark will also be remembered for this! The snow makes the landscape even more impressive. 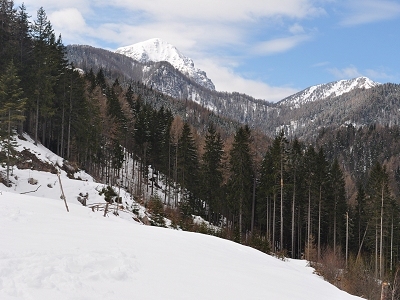 In the background the highest peak of the Karavanke / Karawanken Geopark, the Hochobir mountain (2139 m a.s.l.). After a 45 minutes long transfer and the crossing of the Slovenian border, we reach the Mežica mine, the last stop of the excursion. In the Geopark information centre, Alessia Amorfini is studying the geosites of the Karavanke / Karawanken Geopark ... the most difficult test is to balance on a "Fantozzi/Fracchia" type armchair! After wearing raincoats and helmets, ritual photos in front of the tiny wagons that will bring the group inside the mine. 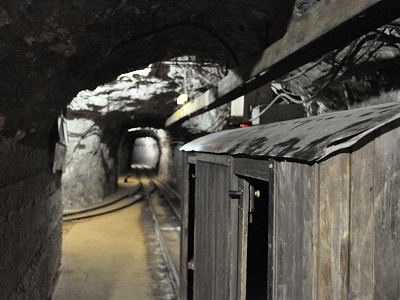 The mine for the extraction of zinc and lead was inaugurated in 1665 and was active until the 90s since it was transformed into a tourism geosite. At the middle Suzana Fajmut-Štrucl, geologist and director of the company that manages the geosite. The journey in the small train, along the mining tunnels, completely in the dark and in a deafening noise, is a unique and somewhat traumatizing experience. After 15 minutes to travel a distance of about 3 km we find ourselves in the heart of the Veliki Vrh mountain formed by the dolomitic limestones of the Middle and Upper Triassic at a depth of 600 m from the surface. 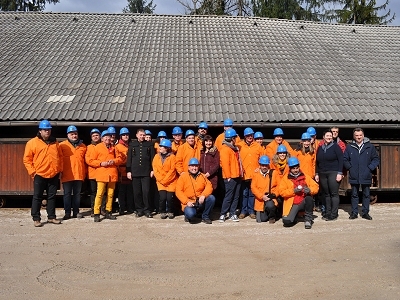 In the large hall of the mine once used as dining hall for the miners the guided tour begins with the historical framework of mining already started in Roman times and which has greatly influenced the economic and social development of the populations of this region between Slovenia and Austria. 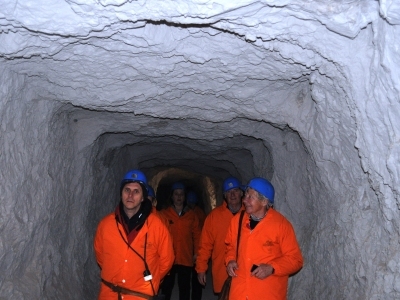 The group descends along the illuminated tourist route in different mine levels. In total the levels are 20, the deepest ones currently completely below groundwater level. 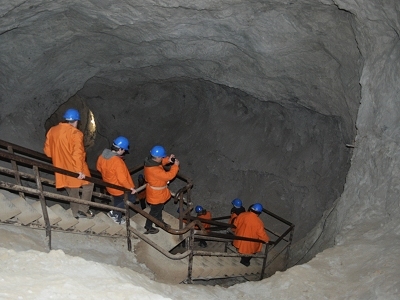 Even in the Mežica mine, rocks are frequently cut by fault structures. Alessia Amorfini while "brushes" a fault surface where the relative sliding between two rock blocks is visible. 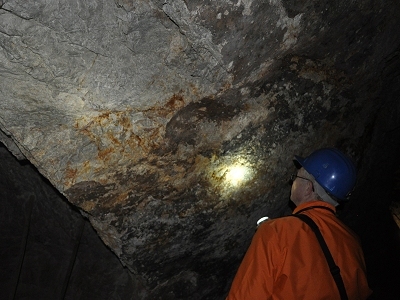 In a darker section of a mine tunnel, it is still Manfred Kupetz who lights up another fault that cuts the dolomitic limestones; the fault surface is coated by iron and manganese minerals. 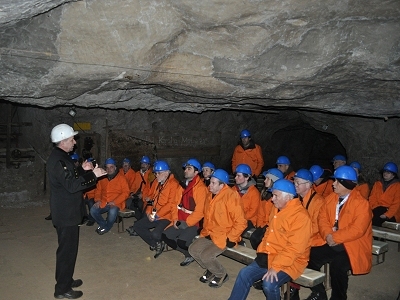 The group continues the visit along the tunnels of the Mežica mine. In the front row a smiling Lorraine Chenot from the Monts d'Ardèche Geopark (France) and a more worried Aniello Aloia from the Cilento-Vallo di Diano Geopark (Italy). In the background we can recognize Tony Ramsay from the Fforest Fawr Geopark (Wales) and Alessia Amorfini. 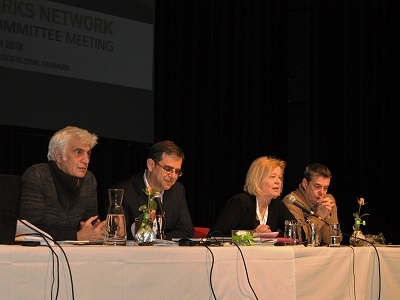 The 41st Coordination Committee Meeting of the European Geoparks Network has ended. 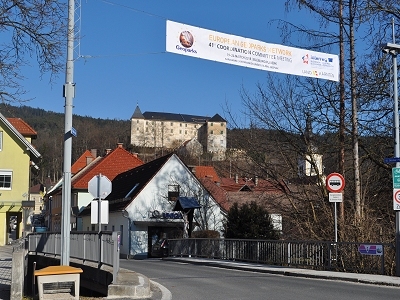 A final image of the village of Bleiburg/Pliberk, dominated by its own "lead castle", which has friendly greeted the representatives of the European geoparks.